Fitness Coaching – We go step-by-step to make sure you get results safely and effectively. Weekly Lesson (live) – The conference call lesson is like being there with me on a podcast. Get your questions answered right there. Weekly Q&A (live) – During the conference call Q&A, you get direct answers to all of your health and fitness questions. Online Community – This is where you have a supportive community for accountability and encouragement. Online Resources – Learn more about health and fitness, discover new workouts, new exercises, and participate in any of the 40+ Fitness Challenges. Chat and Email Support – I'm online during office hours to support you in any way I can. I'm so confident that I can get you the results you want. 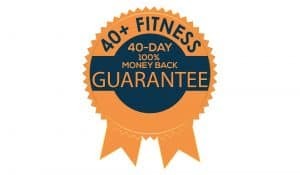 If you're not completely satisfied with your results within the first 40 days, I will refund your money, no questions asked.